Put down the phones and make conversation around the table with this recipe card-inspired kit. Here's some food for talk: Family time means more when we put down our phones and make conversation around the table. 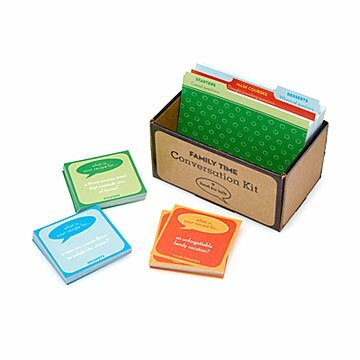 This kit inspires just that with imaginative conversation prompts like, "What is your recipe for surviving without the Internet?" and "What is your recipe for throwing a party in zero gravity?" Divided into sections by "course"—starters (casual questions), main courses (thought-provoking questions), and dessert (whimsical questions)—everyone is encouraged to share their ideas for "ingredients" and instructions to create each scenario. You can even record favorite conversations on the included blank recipe cards to create a keepsake. Packaged in a cardboard recipe box for easy storage, it's our secret sauce for spending time together and strengthening the family bond. Made in San Antonio, Texas. Click to view examples of starter, main course and dessert question cards. Includes 105 recipe and 105 prompt cards. I bought this game as a Secret Santa gift for a co-worker with two children. The family spends the holidays baking and preparing traditional family dishes, and since they're traveling this year for Christmas I thought this kit would be perfect for them while they're on the road. I spent a bit more than planned because I loved the recipe format and the fact that all ages could participate. I also hope that the kit will help them create new family memories. I still love the idea and think the gift will be well-received, but I was disappointed in the packaging. Basically, the box as shown with the cards inside is all you get--there's no lid to the "recipe box," and the whole thing is just shrink-wrapped. For the price, I thought that was a little stingy. In fact, once the plastic wrap is removed, the recipe box will be susceptible to spilling, and the cards can scatter in the car--a recipe for disaster. :) I suppose rubber bands can be deployed, but this is a strange set-up for a product touted as travel-friendly. The packaging and the name of the kit make this seem more like a prototype than a finished product. If I were selling these kits, first thing I'd do is change the name to something more fun and better connected to cooking/recipes: Kitchen Table Talk? Roundtable Recipes? Creative Conversation Cookery? OK--I'll keep my day job. But overall, this is a perfect gift for the family who will receive it, and that makes me happy. So, with all the disclaimers, I would recommend this kit to others.